Calculus hasn't changed, but your students have. Many of today's students have seen calculus before at the high school level. However, professors report nationwide that students come into their calculus courses with weak backgrounds in algebra and trigonometry, two areas of knowledge vital to the mastery of calculus. University Calculus: Alternate Edition responds to the needs of today's students by developing their conceptual understanding while maintaining a rigor appropriate to the calculus course. 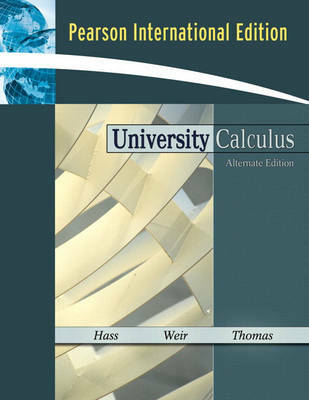 The Alternate Edition is the perfect alternative for instructors who want the same quality and quantity of exercises as Thomas' Calculus, Media Upgrade, Eleventh Edition but prefer a faster-paced presentation. University Calculus: Alternate Edition is now available with an enhanced MyMathLab (TM) course-the ultimate homework, tutorial and study solution for today's students. The enhanced MyMathLab (TM) course includes a rich and flexible set of course materials and features innovative Java (TM) Applets, Group Projects, and new MathXL (R) exercises. This text is also available with WebAssign (R) and WeBWorK (R).